No wonder rhubarb crisp has been around for so many years. It’s doggone good! Ever since I’ve been a young girl rhubarb crisp has been a favorite dessert of mine. I associate rhubarb crisp with the heavenly summer months. I say heavenly because I grew up in Michigan and winter likes to last for 9 months out of the year. LOL! Rhubarb always grew wild at my grandma’s farm and was so much fun to pick! My sisters and I always thought it was neat that we could pick ourselves a little treat to eat out of the yard. We always had contests to see who could stand the sour taste the longest. Grandma would often give us each a tiny bowl of sugar to dip the stalks in. Fond memories! USE THE RED NEXT PAGE LINK BELOW FOR THE RHUBARB CRISP RECIPE. 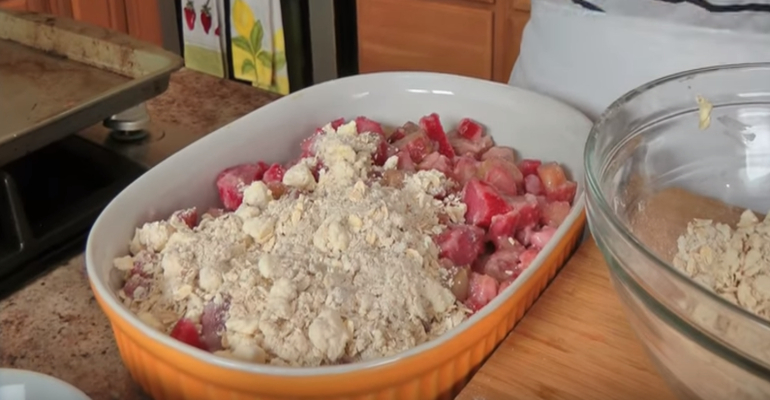 Quick Tip: Feel free to use freshly picked rhubarb or frozen in this recipe.